Summer is the time for dreaming and scheming about a new and improved landscape. What follows are 4 landscaping ideas for summer that will spruce up any home, while reducing the amount of time you spend on maintenance. These tips are a life preserver for beginning gardeners determined to improve their yards without making it a full-time job. 1. Don’t fight Mother Nature. Instead of going the highly sculptured route, let mother nature do all the hard work for you. If you have mature trees, create a magical woodland garden of ferns and moss. On a sunny slope, grow drought-resistant alpine plants, or those with gray or succulent leaves that thrive in poor, dry soil. If you have a small yard, use dwarf plants. 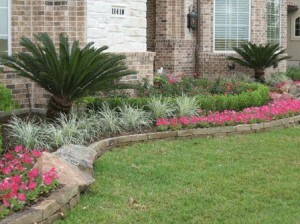 Instead of growing formal hedges that need constant trimming, plant blooming shrubs in a staggered row. Let them flop and grow together in a tangled mass of seasonal color. This natural landscape will create a picturesque foliage, while at the same time greatly reducing the amount of maintenance work needed to keep it looking nice. 2. Just bury your mistakes. Try plenty of new plants in your search for what wants to grow best in your yard. Variety is the spice of life. Remember that you don’t need to make a lifetime commitment to your plants. If your new plants are not working out, get rid of anything demanding or disappointing. For example, roses with diseases, shrubs that refuse to bloom, or floppy, messy flowers may not be worth the trouble to you. Try moving a problem plant to a new location. If it doesn’t shape up, use the shovel solution. No plant purchase is a mistake. It may just become a composting opportunity. 3. Keep your friends close, but your thirsty plants closer. The stifling heat of summer can scorch even the most hearty of plants. In order to save your most prized landscaping gems, keep potted and thirsty plants close to a water source because they will dry out the fastest. Drip irrigation with spaghetti tubing is a great investment if you have lots of container gardens. The farther away from the water source, the more drought-resistant the plants need to be. 4. Rocks are hard to kill, and they don’t need weeding, feeding or pleading to keep them looking good. If you have blank patches of soil causing an eyesore in your yard you might want to plant boulders instead of bushes where nothing wants to grow. Do something creative if you have a lot of rocks in your soil. A dry stream bed, raised rock wall, stone embedded path or even a bench covered with pebbles makes rocky soil a free source of landscape material. Plant your boulders in family groups; from Big Papa, down to smaller offspring nearby to make a natural outcropping. Remember to bury at least one-fourth of large rocks for a more natural look. For finding the best deals on lawn mowers, edgers, hedge trimmers and other landscaping tools, head over to www.shankslawn.com today. This entry was posted in Uncategorized and tagged Equipment, Ideas, landscaping, Summer, Tools. Bookmark the permalink.